Fender bender or major repair? We can fix that! Hello! Sorry to hear your vehicle had a collision! The good news is that we can get your baby operating safely and looking great at either of our two collision repair shops. Click below or call for a free estimate. From small dents to serious damage, we service all vehicles with the state-of-the-art equipment, master technicians and ‘Gold Class’ certification (only awarded to top 10%!) to get your vehicle back on the road fast. P.S. In Texas, you have the right to choose where your vehicle gets repaired, not your insurance company. Keep San Antonio strong by choosing a local company! Red McCombs Collision Center is certified Gold Class by I-CAR, the industry leader in expertise certification and training. Only 10% of collision repair shops can qualify for this distinction. 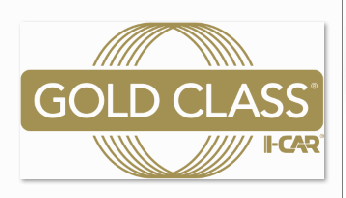 To be a Gold Class shop, our technicians are trained in the proper repair techniques and procedures that contribute to the complete and safe repair of your vehicle. From dents, dings, and scratches to serious collision damage, we have master techs to repair and pamper your baby. Glass repair back to factory standards! On site and state-of-the-art paint booths manned by our color marching experts. We work with most insurance companies and have rental cars available onsite. Nothing’s more annoying than finding a dent or scratch on your car. Whether you backed into your garage door or found that someone opened their door into yours, we can eliminate the mark and get your car back to the way it was before. Our certified technicians can eliminate dents, and our state-of-the-art downdraft painting booths can have your car truly look like nothing happened. When an accident happens, your car may no longer be driveable due to the amount of damage inflicted. We’re ready to help get your car back to pre-collision condition. Our I-CAR Gold Class technicians are experts in indentifying parts that need repair or replacement. They’re also trained to find hard-to-diagnose hidden damage. We use sophisticated, computerized alignment machines paired with OEM guides to bring your vehicle back to original specifications. There aren’t many things as frustrating as having a rock kick up and hit your windshield on the highway. Or, maybe you had hail take out your back window. Whether glass is scratched, cracked, or broken, we can work with your insurance company to get it fixed and back the way it should be. We repair problems back to factory standards for your safety. Given the rise of aluminum body vehicles and the unique challenges associated with this new material, we’re DRIVEN to lead the way in aluminum body repair. Red McCombs Collision Center is a Ford-Certified Aluminum Repair Facility, which means we are Ford-recommended to repair body damage on any aluminum Ford product. 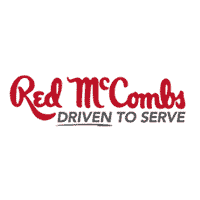 As a member of Red McCombs Automotive, we have direct access to OEM factory parts as well. Not every body shop has the complete suite of services onsite. We have the ability to complete the majority of our work in-house, including painting. Whether it’s painting a new part, re-painting a scratched bumper, or working on a whole car, we have the technology and experts to provide exceptional, quality work. We use a PPG computer-aided paint system to ensure a cost effective and perfect color match. We also have best-in-kind downdraft painting booths to ensure your vehicle is professionally taken care of. No matter the problem, we know this is a difficult process – so we look to streamline it as much as possible. We offer you the ability to check the status of your vehicle without picking up the phone. We offer towing services to save you a call to another company. We offer Enterprise Rental services on-site. And if you don’t get a rental car, we’ll shuttle you to a destination of your choice. We are a direct repair provider (DRP) for many insurance companies, which helps us communicate more efficiently and repair your vehicle faster. If you need financing to pay for your deductible or the repair work, our partner CFS offers instant approval loans you can submit in as little as five minutes.